Siteswap is a notation for describing juggling patterns. This video from the BBC features Colin Wright, Siteswap's inventor, explaining how between the patterns 4,4,0 and 4,4,2 they spotted the pattern 4,4,1, and thus notation enabled them to discover a way to juggle that no one had seen before. What better story to illustrate the power of programming languages? 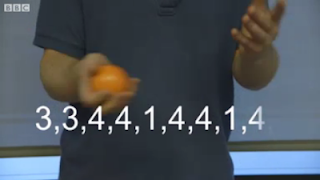 Is there a way to verify sequence of numbers if it is a valid juggling sequence? Yes: if you expand the sequence to infinity, will you ever have intgeger i+k at position m and i at position m+k? Then the sequence is invalid (two balls land at the same beat). 440 and 442 are both invalid in this sense (but work if suffixed by 333333..), the corresponding infinitely periodically eextensible sequences are 4440 and 42.